Women For Action interviewed one of the founders behind a bright innovation called The Whole Works, a Public Benefit Corporation that plans to do business differently. Their “no business as usual model” will employ women a living wage for handmade designs in the USA. We asked how this would work. Read what Sadye Harvey had to say! Women For Action: Let’s start with telling Women For Action a little about you, your background and how did the idea The Whole Works come about? Sadye Harvey: I have been in the fashion industry for the past two to two and a half years. I developed an interest in clothing production through my former place of employment. The production operation was located in the city of Los Angeles, where I am now living. I had the opportunity to work in person with our contractors, and to understand that everything was being made by real people. As a society, we forget that sometimes. I think we've become immune. Through my work, I've witnessed people making truly remarkable things, though they are behind the scenes. This led to my increased interest in the production side of business and a reduced focus on the design side. The Whole Works clothing manufacturing facility is opening up in Rifle, Colorado. 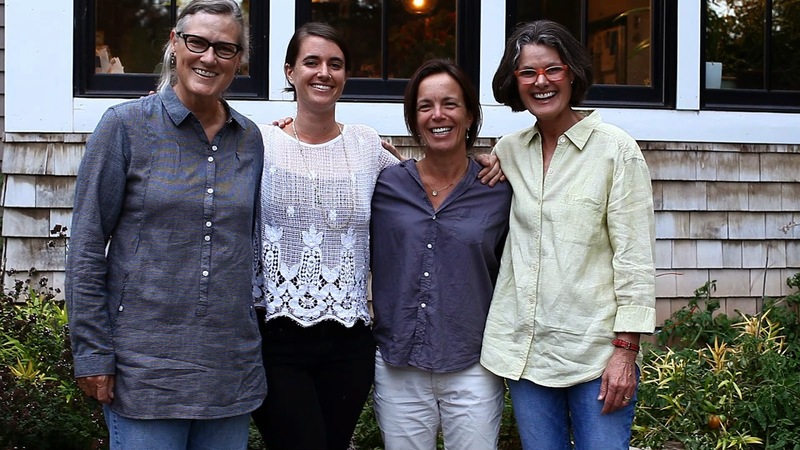 It was actually the brainchild of our co-founders, Julia Marshall and my mom Kelly Alford. Kelly had been looking for American manufacturing facilities for her line of women’s accessories, and started a conversation with GarCo Sewing Works, a non-profit in Rifle. GarCo collaborates with the local community college and trains women in sewing and design as a way to transition from federal assistance, and prepare to re-enter the job market. These women have an opportunity to learn really detailed-oriented, skilled work, such as production sewing, cutting, and project management. Kelly and Julia envisioned The Whole Works as an extension of this idea. We are a for-profit business that employs women once they complete the job-training program. The Whole Works is a full service contract manufacturer, offering beautiful, high quality products, produced with care and dignity by women from the community. Women For Action: Can you tell us about your personal designs? Sadye Harvey: I don’t have an ongoing line. I do personal work, and sew and create patterns on commission, but I don’t have a line of my own. Women For Action: Tell us about the nonprofit platform and how this could have posed some difficulty in funneling a new program for living wage employment. Sadye Harvey: GarCo Sewing Works (the non-profit program with which we are partnering) provides a six-month training program and is a part of a larger series of similar programs in other fields. The women can generally only stay in the program for six months and then they cycle out. They will either go to another program, find a job, or sometimes they return to federal assistance. The program is not a long-term solution but it provides training. There is this growing group of women that are getting trained in production sewing and have nowhere to go. If they wish to continue in the field of sewing, then the Whole Works is willing to offer an opportunity for work. In addition, we are one of the only clothing manufacturing facilities in our area, so we would be conveniently available to designers in the West as well. Women For Action: What does the name The Whole Works mean? Sadye Harvey: It represents our experience and belief that when a business seeks to maintain a connection between all the stakeholders- family and work, public and private, business and design, profit and nonprofit when all those things are represented under the same roof, then things work well. It is the notion that wholeness is the best model. It is our vision to create a work environment that supports our employee’s whole selves, and encourages pride, dignity and ownership in their work. As we settle into the community we will work with other community members to address the needs of families, such as childcare and transportation to work. Our model is based on considering the whole person and what that really means. Women For Action: There are initiatives in underdeveloped nations that offer training for skills such as sewing and pose economic stability. Why do you think companies like yours are so few and far in between in the United States considering the high poverty rate? Sadye Harvey: Unfortunately, clothing prices have been distorted by unfair labor wages and dismal working conditions. People expect their clothing to be inexpensive. In the United States, the real price of labor, even when paying a poverty wage, puts clothing in a higher price bracket than when it is made in countries with lower costs of living. If you are paying a living wage, it automatically bumps things up into almost a luxury cost, which simply reflects the time and skill necessary to make clothing. Yet at the same time, the “Made in America” brand is gaining a lot of popularity, especially for American companies, because it’s easier to work with factories in the United States. The manufacturing turnaround time is faster, the minimums are lower, and the communication is clearer which could save a lot of money in the long-term. Women For Action: So, are each of these handmade products uniquely made? Sadye Harvey: We are a contract sewing facility, so we will be working with designers who need their production manufactured. The Whole Works will offer pattern-making services. We will be able to put the designer’s pattern into a computer, digitize it, grade it, cut it and then sew their production. Designers will come to us to sew their clothing and they will be responsible for selling it themselves. Maybe later on down the road we will set up a private label program for certain styles so that designers can choose from them. But that is down the road. Women For Action: What sort of feedback have you been receiving about this new enterprise? Sadye Harvey: It’s been really positive. People seem excited. It’s inspiring for small and emerging designers because we will be catering to them as well as established designers. We really want to be available to people who are just getting into the industry. People seem extremely enthused in Rifle because this development impacts them the most. Also, we've actually received a great deal of feedback from designers and production directors in different parts of the country who want to start something similar to The Whole Works in their home town. This is pretty cool because we see The Whole Works as a model that can could be replicated. It’s perfect for small towns where there is a need for jobs and you know, there is always a need for clothes! That’s not really going anywhere. That’s what I always say: everybody eats food, and everybody wears clothes. Sewing is a fantastic skill to have. It’s a very dignified trade. Everybody should know how to sew. Women For Action: Have you secured any contracts with designers? Sadye Harvey: Yes. We are currently working with a few designers. We just finished our run of production with one designer. Women For Action: How is the crowd-funding campaign going? Sadye Harvey: The campaign went extremely well. We finished on November 29th. We've exceeded our goal of $35,000 and garnered $38,000 through our Kick-starter campaign. We were really blown away. Women For Action: What other steps would you be taking to launch this company? Sadye Harvey: I think our outreach is a huge focus right now. We really want to build a community of designers who believe in our vision. We are based in the United States and will pay a living wage as oppose to a minimum wage. Our product is going to be a little more expensive than others, but it will be high quality. At this point, we are trying to find people who are dedicated and want our story to be part of their story. So that’s our next step. With the funding we've received from Kick-starter, we can cover all our initial equipment costs. Down the road we will be look into additional funding through investors. We are starting small. We don’t want to get too carried away or have it taken out of our hands, per se. Women For Action: What is the face of Rifle, Colorado right now? Sadye Harvey: Rifle is a little town off of the I- 70 corridor in Western Colorado. At this point, its main industry is natural gas drilling. The infrastructure is nicely maintained because gas money flows through there. The Whole Works is located in the adorable downtown area, which has an “Old West” feel. Rifle is nestled between the Colorado River and beautiful cliffs and mountains. Rifle is home to some of the best rock climbing in the world. You get this interesting cross between the natural gas community and this rock climbing community where people come from all over the world. There are rock climbers, cowboys and natural gas workers...and now there’s us! It’s like a wonderful little cultural melting pot in a way. Women For Action: Is the surrounding community familiar with this new development and are you expecting support from them? Sadye Harvey: Yes. GarCo Sewing Works, a darling of Rifle - everyone loves them. They have done a lot of good work for the community. So it’s great that we have them as a partner going forward. It gives us a little credibility for what we are doing. The town has been incredibly supportive, and has helped to make our opening seamless. In addition, there is a flourishing creative community in the area, and we have been getting a lot of positive feedback from local designers and artists. Women For Action: We have talked about the positives upon developing and creating this new idea. But what sort of challenges have you've been faced with? Sadye Harvey: I think the biggest challenge we've faced is how to scale this new enterprise. Our objective is to possess the capacity to take on large projects, which would enable us to financially secure our business model. There is a lot of great new technology that wasn't available five or ten years ago. We are striving to be an efficient and innovative manufacturing facility. We would like to invest in some of these terrific new advances- but they can be expensive. At this point, we are strategizing how to get there. However, we are pacing our efforts towards that. We just have to keep in mind that creating new jobs is the most important part. The question is how do we create enough jobs while maintaining quality and efficiency? We are just trying to maintain balance and make sure that we are staying on par with our vision and our mission, yet at the same time attempt to be cutting edge. We plan to stay on the forefront of new technology. Women For Action: Tell me briefly about this team of women co-founders. How are you attempting to maintain balance as co-owners? Sadye Harvey: Our team of co-founders consists of Julia Marshall, Kelly Alford, Janie Rich and myself. We've known one another for a long time. I am the youngest of the four. Kelly, Julia and Janie’s relationship with each other goes back really far. We are all neighbors and friends. We are all equally inspired and driven by the ideas behind The Whole Works. So it’s good that we are starting out on the same foot. Even so, we were aware that partnerships can go sour, even with the best intentions. We have held countless meetings and a retreat to discuss the details of our partnership, and to get every aspect of it in writing. So if a complications were to arise, we've discussed different methods of handling them. We created a list of suggestions if such an issue was to surface. We've decided how we wanted to divide the ownership shares and workload. We have also discussed ways to communicate if we are feeling overloaded, left out or confused. We've shared our goals, visions and how we’d each like to get there to make sure that we have a common thread and are on the same track. We have it all written in a charter, which is our little bible that keeps our partnership on track. We plan to review it every year. Women For Action: Was there anything new that you learned along the way? Sadye Harvey: I am 25. I have never started a business. So the entire process has been a learning experience for me. I am working with two women with entrepreneurial backgrounds who are incredible. Julia Marshall owns a landscape architectural firm and my mom, Kelly, is a graphic designer. She started her own design and manufacturing business, which she eventually sold. Janie Rich is an educator. She’s been a teacher and a community leader for some time. So they are coming into this with a lot of expertise and I am just along for the ride. It has been pretty amazing. You know, working through the partnership was the biggest learning experience for me. I think it’s easy to form a good idea with someone and say, “Let’s go. Let’s do it!” Yet it takes time to make sure that you are aware of the pitfalls. Because the pitfalls are what’s going to take you down. So exploring them with great clarity from the beginning is truly important. Women For Action: What would you say to woman who is clearly struggling and attempting to raise her family but she isn’t making a living wage? Sadye Harvey: There are a lot of things working against people out there especially women raising families. Maintain hope. Reach out your community and ask for help. Be kind to yourself. I’d like to add that hopefully more people will start to realize that women are really valuable. They are a valuable part of the work force. Hopefully more business owners will realize that paying people a minimum wage is ridiculous. You need to be paid a certain amount to live, especially if you have children. Hopefully people will start to get on board with this model by creating good jobs and taking into consideration that people are human and are trying to do more than merely survive. Women For Action: What are some of the costs that you incurred so far? Sadye Harvey: Mostly there have been physical costs such as getting our base and equipment set up. That was the majority of the cost. The great thing about this partnership that makes our business viable is that a lot of the employee training, which is a very expensive part of the process, is happening at GarCo Sewing Works. They are already set up as a training program. So our employees will come to us trained. That will not be a cost that we would have to incur. Women For Action: Will you be obtaining any government subsidies and assistance? Sadye Harvey: I am not an expert on government subsidies. I do not think we qualify for anything because we are a for-profit. We are seeking out traditional means of raising capital such as finding investors, forming partnerships with other companies, and crowd-funding, which is a great way to help start-ups. Sadye Harvey: The Whole Works is sort of a new business model. We are a Public Benefit Corporation which is a new type of corporate designation. We are a for-profit business but are legally obligated to make a positive impact on the environment and in society. Though we also have to pay attention to our financial bottom-line, we make choices that are more focused on social and environmental sustainability, even if it impacts the bottom line a bit. We are not like most corporations who lean more towards the profit-making side. They have to make sacrifices in specific regions just to ensure that they get the most bang for their buck. We are one of the first Public Benefit Corporations in Colorado and in the country. It’s pretty exciting!